The hunter waits silently and motionless nearby in a “blind” or “stand”. This can be on the ground but is usually in a tree, for better visibility. Distances between the stand and the bait normally range from 30 to 50 yards, although sometimes further. The bear is shot when it comes to feed on the bait. Bears have three main senses: their best is scent, followed by sight, and finally hearing. All are acute, but their sense of smell is phenomenal. Bears approach bait sites in a hyper alert state because of the human odor left from depositing the bait. If an incoming bear smells you, it’s gone; you’ll never know it was there. Most hunters wear camo. Guides recommend washing hunting clothing in scent-free soap and storing it in a scent-free bag until use. Hunters also wash in scent-free soap, and do not have any human-related odors on them, like deodorant, shampoo, or bug dope. A bear will circle the entire bait site testing the wind, before entering the clearing, and will detect these odors instantly. Sight is also important, and about 75% of hunters use either face paint or a mask. If you glimpse a bear moving around the outside edge of the clearing but it won’t enter, it probably saw you move slightly. 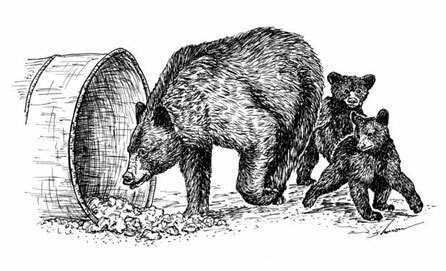 Sound is the bear’s third defense, and stories abound about how a bear was entering the clearing and a hunter cracked his knuckles, or snapped the safety of his rifle too fast and loudly, or even adjusted his hat, and the bear whirled and left. Hunters park a minimum of 100 yards from the bait, and walk in quietly, with absolutely no talking; no human voices around a bait site. They wear rubber boots to minimize human scent, and do not touch anything on the way in. Hunters are normally on the baits by noon, and stay on until dark. If you think hunting bears over bait is like shooting fish in a barrel, try sitting odorless, motionless, and silently in a stand for 4-5 hours at a time, for 15 days. Bait placed in a clearing allows hunters to evaluate the size of bears; 55-gallon drums are 24 inches in diameter and adult bears are normally 26 inches or more high at the shoulder. Bait also allows hunters to avoid killing a female with cubs – or the cubs themselves. In thick brush, a 60-lb. yearling alone can seem huge. Deer hunting is universally acknowledged to be difficult, sporting, and challenging, and Maine deer hunters have a success rate of about 23%. That’s about the same as bear hunters using bait. ● Since bears are out in the open, usually for at least several minutes, hunters can closely examine them. Some bait sites use 55-gallon drums to hold the bait. These barrels are 24 inches in diameter and 36 inches long, and provide something to judge the bear’s size with. Some hunters drive a stake 26-28 inches high in the ground beside the bait, for the same reason. Since adult bears average 26-28 inches high at the shoulders, this lets hunters avoid shooting smaller cubs and yearlings, and select larger adult bears. ● If a female has cubs they will show up at the bait with her, so hunters can avoid killing females with cubs. ● Hunters can wait until the bear gets in the correct position and stands still, offering a perfect shot into the vital area. Also, the stand usually has a solid member that the gun can be rested on, further guaranteeing ideal bullet placement. Using everything in your favor to make a perfect shot and kill the animal humanely is not unsporting – it’s the essence of sportsmanship. Bob Noonan has published well over 1,000 articles in magazines ranging from Reader’s Digest to Down East, and numerous others. He has edited and published several outdoor magazines.